When I first entered the Public Relations and Advertising program at Lethbridge Community College at the ripe age of 19 years old – I would have been surprised to think I would one day take on a leadership role as the President of the Canadian Public Relations Society, Edmonton. You see, initially I went into Public Relations because my mom thought it would be a good fit and I felt it would be awesome to leave Calgary and go to school away from home. Little did I know after completing my two year diploma, I would be hooked! 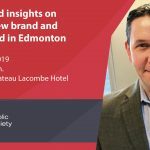 I moved back to Calgary and completed my degree in Public Relations at Mount Royal University and ended up moving to Edmonton after a work term at the Public Affairs Bureau. To me Public Relations has become a way of being. I have been incredibly lucky in my career to meet some of the most talented communicators Edmonton has! My bosses over the years, including: Donna McColl, Cathy Housdorff, Tadra Boulton, Fran Ross, Ronna Bremer and David Hennig, just to name a few – have demonstrated to me the importance of ethics, high standards and being en point in a crisis. I have had the privilege of working with fantastic vendors, Board colleagues, and fellow Public Relations practitioners. I can honestly say I never stop thinking about communications and the analysis of good tactics and strategies. We have an extensive community of communicators in Edmonton. We have watched arenas get built, fires get fought and ‎elections being sought. The talent in this city is rampant. During my tenure as President, I look forward to strengthening our Public Relations community, ‎increasing our membership, and mentoring and nurturing those new to the profession. We have a stellar Board of fun and intelligent communicators who, I know, will serve you proud! Please reach out if you have ideas or inspirations you want to see evolve within the Edmonton Chapter.